For the past 65 years, the process has been this: The photographer comes to school or kindergarten and takes pictures of the children, possibly in different poses. Then a series of photos will be made for each child (for all the same) and sent to the school or kindergarten. The children or their parents can look at the portfolios and if they buy them for sale. The Fotoaktion (photo action) is different. The photographer does his pictures as usual, only we do not deliver finished series, but a free thumbnail with a code for our website. Each family decides for themselves what they get and what it costs - with a detailed preview for each series and with all the pictures in detail. We send the ordered series directly to the parents, or to the desired delivery address. It's that easy. Here in Europe, we enter new territory. 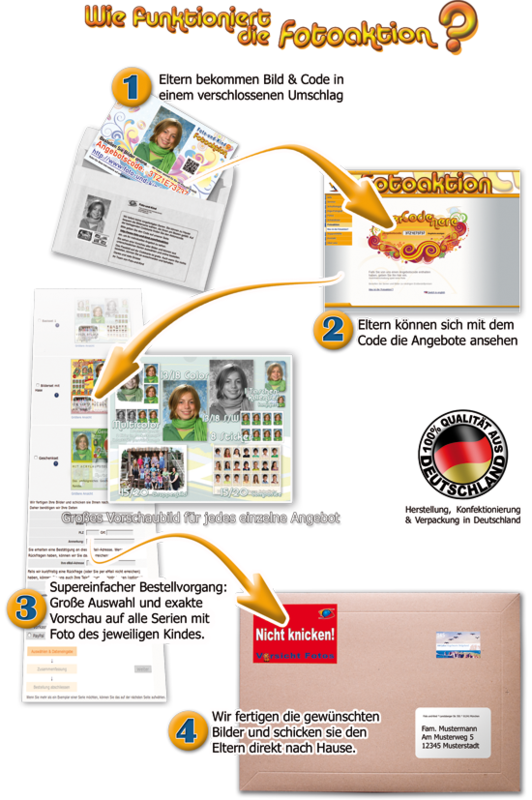 Foto-und-Kind is currently the only provider in the German-speaking area and probably in Europe offering this procedure. The school: No more work with distribution and collection of photo folders and pictures. No debt collection, no returns, no final statement. The parents: more choice, cheaper prices and more peace of mind when choosing. We: Less cost, because we only produce the images that are needed. And last but not least: Even grandma, grandfather and other family members can order pictures, if they receive from the parent or guardian the code - without surcharge to the favorable initial purchase prices.